UAE, Saudi Arabia & Kuwait, Apr 25, 2018 - (ACN Newswire) - Mr Stephen Phillips, HKSAR Director-General of Investment Promotion, is on a five-day tour of the Middle East, aimed at engaging the region's business communities, and advising of the latest business advantages Hong Kong has to offer. The Apr 23-27 schedule covers the UAE, Saudi Arabia and Kuwait where Mr Phillips is scheduled to meet with a broad range of government and business leaders in technology, financial and professional services, banking and retail. Mr Phillips will also meet with officials of Dubai's government-funded FinTech Hive, a 12-week accelerator programme designed to nurture fintech start-ups in the region. In Kuwait, Mr Phillips will attend a business event co-organised by InvestHK and the Kuwait Chamber of Commerce and Industry. 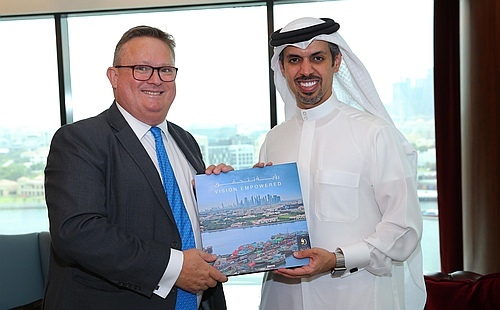 The Director-General of Investment Promotion, Mr Stephen Phillips, meets with President and CEO, Dubai Chamber, HE Hamad Buamin, in Dubai.